We also have Inflatable Pillows for our valued clients. These are also known as Inflatable pillows and is manufactured using rubber coated cotton and polyester fabrics. 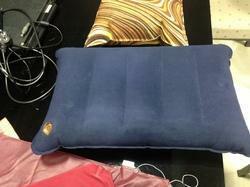 The pillow is custom design as per the clients specifications and is ideal for traveling purposes. Available in different colors and prints these are durable and can be availed from us at market leading prices. Intex Air Pillow provides you complete support with Soft velvet flocked finish for that extra comfort, Specially designed I-Beam Construction, and air Lock facility adds that special touch to the Pillow, It Can be used as back rest or cushion, comfortably provides lower back support. They alleviate pressure points: travel neck pillow designs are ideal in that they easily adjust to the shape of your neck and head whenever you use them. They are soft and supportive: :. Since they are soft and supportive, these pillows provide for amazing circulation of blood making sure that your head is relaxed throughout the journey. It Can Effectively Reduce Sunlight, Increasing The Depth of Sleep and Improves Sleep. work or travel, rest in style and comfort. B & H Entertainment India Pvt. Ltd.
Inflatable Pocket Pillow for relaxing travel. Light compact size great for travel. You will never have to worry about neck pain again, excellent for travel, camping or even indoors. Easy adjustment by inflating for desired support and firmness. Comfortably supports your head and neck. Ultra soft fleece cover. Easy to pack in small spaces.Polyester fleece cover.Washable and colorfast.